I make no secret of my age. …yeah…not really gonna put it out there. Not ‘really’ old. Not old at all really. I don’t even know what ‘old’ is. I’m just not ‘young’ anymore. Not by the counting of years anyway. In my heart, mind and soul I’m still just a kid! I like to play. I like to explore. I like to learn and live and love! I LOVE to laugh. But if you were to look closely at my hands, they would not lie to you. They are telling you my age. Let me apologize in advance should you need to shake my hand. They feel like leather. Not the soft, supple kind either. More like old, well worn, been-wet-but-are-now-dry garden gloves. I’m sorry if I inadvertently give you a little exfoliation as our hands un-clasp. Hey! Why don’t we just wave instead? That will be better, for all of us. The lines upon my hands. The creases. I think my skin has acquired a certain houndstooth pattern across the backs of my hands. Yes my hands are showing the age of me. It’s o.k. though. I’ll adjust to the ‘new’ old me. Just give me time. Well at least my hands still know how to Rock! 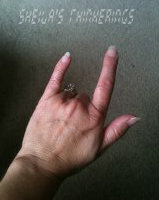 This entry was posted in Hahahaha, Me and tagged age, hand, houndstooth, skin. Bookmark the permalink.